This big and tall stacking chair from OFM is designed to accommodate congregations, auditoriums, meeting rooms, reception areas or anywhere people gather. 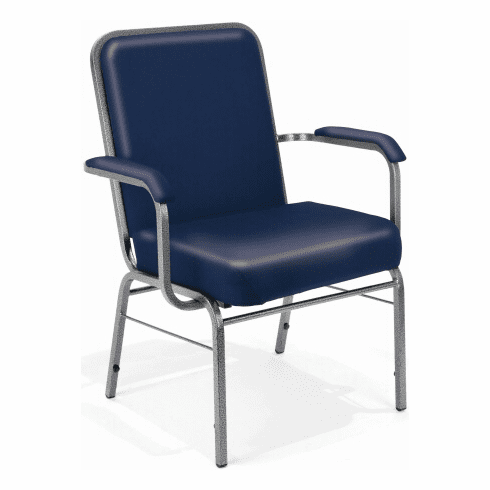 The steel frame with silver vein finish make this an elegant yet durable chair. The anti-bacterial, anti-microbial vinyl covering is also great for keeping rooms germ-free. Other features of this big and tall stack chair include thickly padded, foam filled cushions for added comfort, ships fully assembled, stackable up to 4 chairs high, available in your choice of wine or navy vinyl colors, soft padded and vinyl upholstered arm rests, waterfall seat edge that promotes circulation to the legs, built-in floor glides and a 500 lbs. weight capacity. This chair meets or exceeds ANSI/BIFMA standards. Dimensions: Seat Size: 21"W x 17"D. Back Size: 20"W x 19"H. Seat Height: 18"H. Overall: 35.5"H x 28.9"W x 24"D. Limited lifetime warranty from OFM. These big and tall stacking chairs normally ship in 2-3 business days from our NC warehouse.